Punjabi Juttis were originally made out of pure leather with exquisite embroidery and embellishments. It is the most versatile piece of footwear. You can wear it from day to day wear, weddings, religious occasions, to parties and festivals. It provides an essential ethnic appeal to the person wearing them. Modern juttis is an expression of Indian heritage and ethnic design. A balanced mix of tradition and modernity go into designing this beautiful juttis. They are meant to stand out in any crowd on any occasion. Handcrafted locally, these juttis encourages our local artisans to leverage their craftsmanship, while keeping our heritage alive. A lot has changed since then, from fabric to printed fabric, and basic to embroidered juttis. 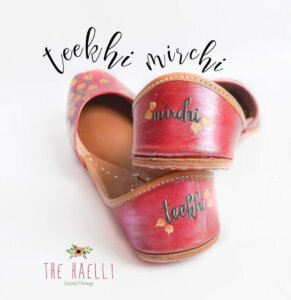 These juttis are now available in the market but at ‘The Haelli’ we started off with something which was never experimented earlier i.e., hand painting the juttis. Keeping intact the incense of this traditional art and blending it with today’s fashion needs, we created designs which are not only liked by juttis lovers, but also by the ones who never tried them. A right pair of juttis can not only help stylize a look but can also help women to escape from the miseries and pain offered under the flag name of high heels and stilettoes. It’s comfortable and easy to slip into. And with a little tweak on the traditional styles, juttis can make quite a statement on contemporary wear. Given that footwear is probably the most underrated aspect of one’s style statement, feel that a pair of fine juttis can lift up an otherwise dull look. Any shoes, juttis or otherwise, can make or break a look. Apart from traditional designs, some quirky motifs including bugs and bees are becoming quite popular among young girls. Also for those who want to keep it edgy, there are slogans which are beautifully calligraphed over the juttis like dekho magar pyaar se, kudi pataka, and so on. We tried breaking the stereotype of wearing juttis and very well succeeded by pairing up them with jeans and dresses. Now, this has become the new fashion statement and can enhance your lifestyle. 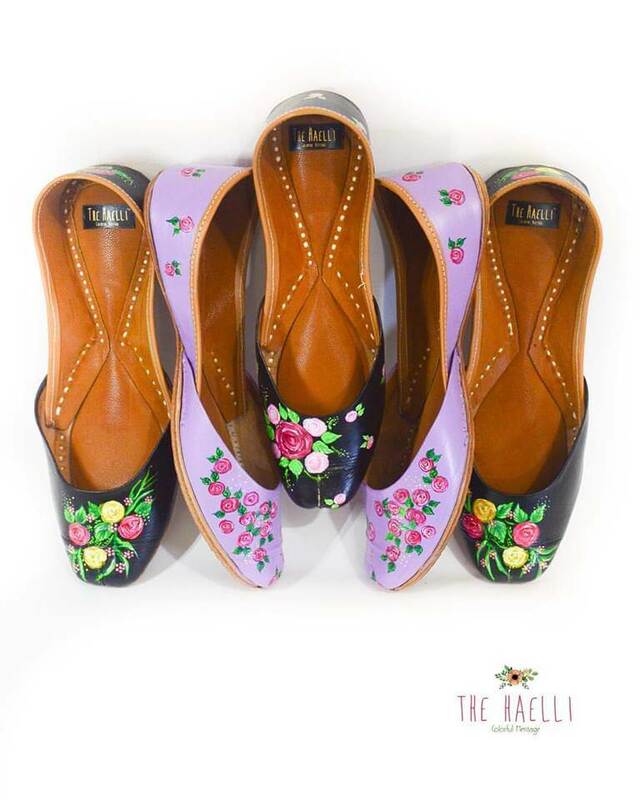 What makes ‘The Haelli’ unique is that you can wear a piece of art and also have the liberty to add a personal touch. They also make a great gifting option on birthdays, anniversaries, weddings or for the bridesmaids complementing them with handwritten notes. Knowing what is hot and trending is one thing, styling it perfectly is another, but then as with every trend, there are some do’s and don’ts to bear in mind. Store your juttis in a muslin bag. It helps keep them dust free and they retain their shine for a long time. Keep your juttis away from moisture. If exposed to moisture, dry them in the sun for two to three hours before putting them back in your closet or bag. If your juttis gets dirty, besides cleaning them with a towel cloth or brush dipped in washing soap, you could also dry-clean them. While we are enjoying the love and appreciation from women as well as the female celebrities who have worn the juttis of ‘The Haelli’. Some popular names are Sonakshi Sinha, Taapsee Pannu, Chitrangada Singh, Swara Bhaskar, Urvashi Rautela and many more.